Palmeri Comments Off on We’re cousins! The site is maintained by Angelo Coniglio. His parents, Gaetano Coniglio and Rosa Alessi immigrated to Buffalo from Serradifalco a little over 100 years ago, around the same time as my great-grandparents Angelo Palmeri and Maria Giambrone immigrated to Buffalo. His web site is filled with wonderful information on Serradifalco, including a partial translation (here) of a history of the town, the original Italian of which I’ve included in pdf form on my site, as well as lots of stories and essays related to his family in particular and to the Sicilian-American experience in general. 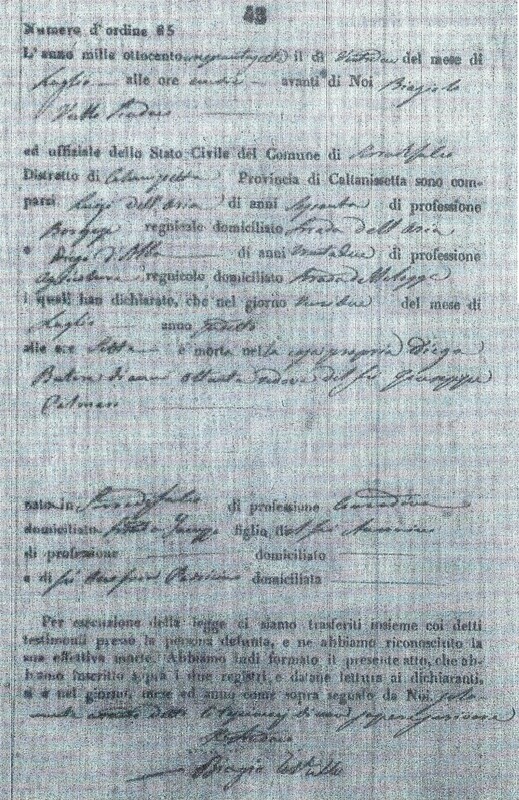 At the time when I was starting on my genealogical research, I knew no Italian – I am only now at an intermediate stage – and his excellent translations of various Italian vital records he has posted on his site (for example, here) were simply indispensable to me in trying to read the records I found searching through microfilm. At some point, Ange emailed me after having found my own web site – this one here – and we corresponded occasionally on Serradifalco, genealogy, and dual citizenship. Ange graciously sent me some records of my family members that he found during his searches. Given that Serradifalco was a small town and that his parents and my great-grandparents immigrated around the same time to Buffalo, it was likely that they knew each other, but could they have also been related? Were Ange and I cousins? No, at least based on the records either of us had found. Then sometime last fall, Ange emailed that his DNA and my DNA on AncestryDNA had a small positive match. We could be distantly related. Just recently, he found a death record with the name Butera. My fourth great-grandmother was Diega Butera – I had it misspelled as “Batera” on my family tree, having mis-read the difficult-to-read script in the records. It turns our that Diega’s sister, Maria Butera, is Angelo Coniglio’s second great-grandmother. That makes us fourth cousins twice removed; in other words, Ange is fourth cousins with my grandfather, Joseph A. Palmeri (1911-1967). My great-grandfather Angelo Palmeri and his father Gaetano Coniglio, who both emigrated from Serradifalco, were third cousins, so even if they knew each other, they may or may not have known that they were related to one another. I’ve only discovered my own third cousins over the past several years. Since I’m now part of Ange’s family tree, that also means that I get to go back two more generations (our common ancestors) because of his research. Diega Butera’s parents (my fifth great-grandparents) were Antonino Butera (who died sometime between the marriage of his daughter Maria in 1787 and the death of his wife Onofria in 1817) and Onofria Porto (Patracino) (born abt 1752, died 9 Mar 1817 in Serradifalco). Antonino Butera’s parents (my six great-grandparents) were Pietro Butera (who died before 1759) and Leonarda (who died after 1759). Onofria Porto’s parents (my six great-grandparents) were Angelo Porto (who died before 1759) and Carmine (who died after 1759). Only a few other branches of my family tree goes back this far in time – two on my mother’s side in Scotland and France, and one on my maternal grandmother’s side from Montemaggiore Belsito Sicily. After registering, login again (https://cittadinanza.interno.it/sicitt/index2.jsp) and add your husband file with the K number and the date you have submitted in consulate. Now I just need to figure out what the "K number" is. After nearly 18 months of work, we stopped at the Italian consulate in Detroit to get our passports. In addition to some paperwork and a few hundred dollars in fees, plus a signature and finger prints for my older son and I, we left with our passports in hand. 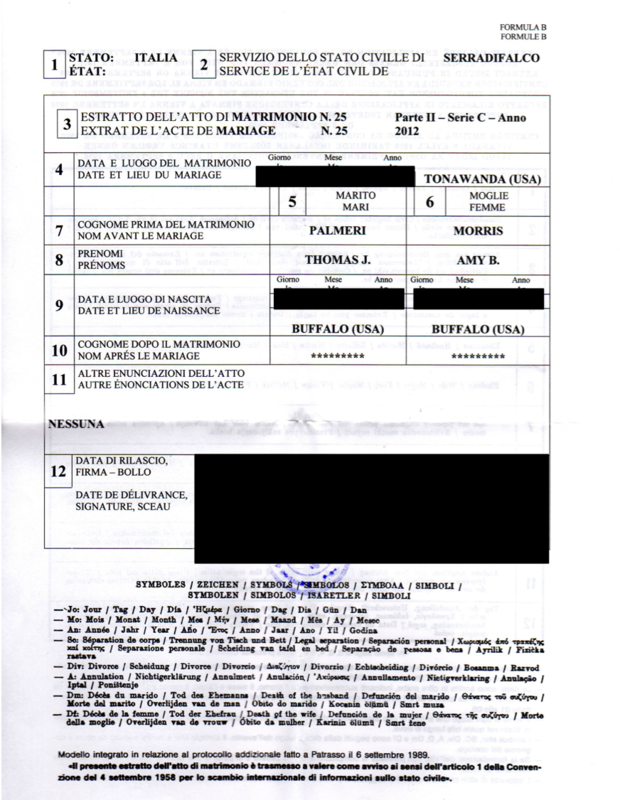 Certified full copy of marriage certificate issued by the Italian Town Hall, "Estratto Del Certificato Di Matrimonio"
 Police clearance or certificate of criminal records (certificate of good conduct) issued by the central authority of each state of which the applicant has been a resident since the age of 14, accompanied by a translation into Italian; for us, that means New York, Indiana, Tennessee – consulate said "this office will certify the translation"
 F.B.I. 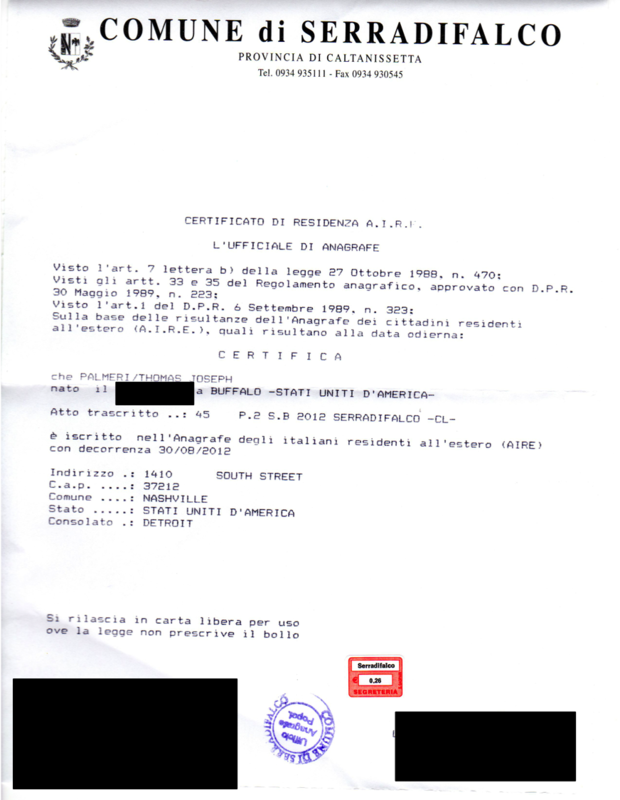 Clearance with finger prints form (in addition to the above certificate/s), with translation into Italian – consulate said "this office will certify the translation"
 Payment of Euro 200.00, proof of bank transfer – consulate said "copy of the wire transfer is fine" – someone on the Italian Citizenship Message Board warned "Be sure to watch for any 'incoming wire transfer' fees that may be discounted from the 200E that you send, depending on what method that you use. Would had to 'deposit' 200E, then find out later than the application may not get accepted because there as a 10E incoming wire transfer fee that was subtracted from the 200E, only giving them 190E." Translations received for the background checks (FBI, NY, IN, TN). Total $100 for the four of them. Only thing left is the apostille for the FBI background check to arrive. I while back, I did a mass mailing to a lot of Palmeris listed in the Buffalo phone book. I ended up finding a bunch of grandchildren (and one child) of the Palmeri brothers, Angelo, Calogero, Pietro, and Salvatore. This week, I got a message from a grandson of a Pasquale Palmeri, who was also born in Serradifalco. Apparently, Pasquale, born in the 1860s, was a cousin of the Palmeri brothers and came over with them to the United States. Pasquale and his wife Ida and their family lived on 7th Street in Buffalo, the same street that my great-grandfather Angelo and his brother Calogero lived on. 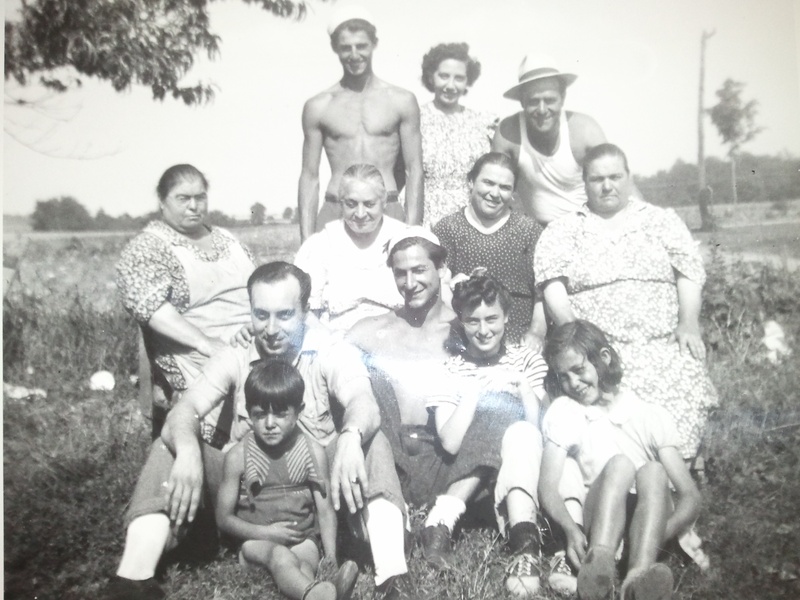 He also sent a photo, probably taken in the days when the Palmeri brothers and Giambrone sisters – and their cousins – worked as farm laborers down in Eden, picking peas. I gave him the link to the Story of Charles and Barbara, and he recognized my great-grandmother, Maria (Giambrone) Palmeri, and her sister, Barbara (Giambrone) Palmeri – women that he could never identify in this photo. Oh, and the Jim Palmeri in this photo is the person who accidentally shot Josephine (Palmeri) Christopher with a BB gun in the story of Charles and Barbara. Another copy of the NY background check with an apostille arrived today. I think someone from the NY Secretary of State's office must have gotten the background check notarized and then they apostilled it and returned it. Very nice. In addition, the FBI background check came today. Send it off for an apostille by the Department of State in DC. Finally, the NY Background Check arrived in the mail. Well, actually what they sent was a signed and certified letter saying that what I received before was all I would receive. So I attached that letter to the check. Mailing the combined off for an apostille by NY. 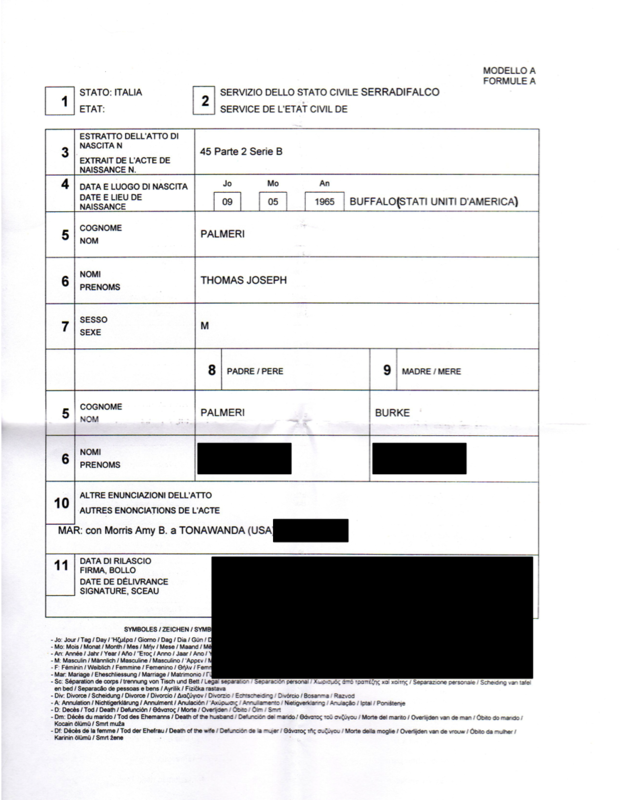 A jure matrimoni application requires "police clearance or certificate of criminal records issued by the central authority of each state of which the applicant has been a resident since the age of 14, accompanied by a translation into Italian." Today, my wife obtained her finger prints from the Nashville Police Department ($12). We need to pay for background checks: NYS Division of Criminal Justice Services ($60.75), Tennessee Bureau of Investigation ($29.00), Indiana Digital Finger Prints ($12), Indiana State Police Background Check ($10), and FBI ($18.00). – please do not send money at this time. Two letters arrived from Serradifalco, Sicily today. One had birth certificates for me and my two sons and the marriage certificate for me and my wife. 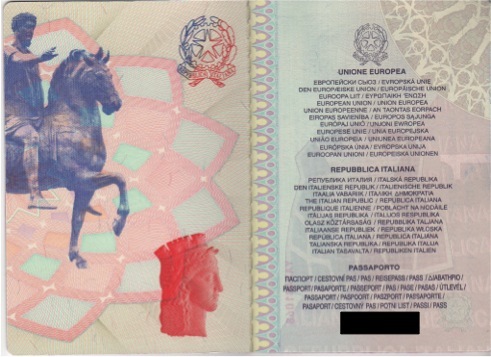 The other had AIRE documents for me and my two sons; the AIRE is the registry for Italian citizens living abroad. It's now officially official. 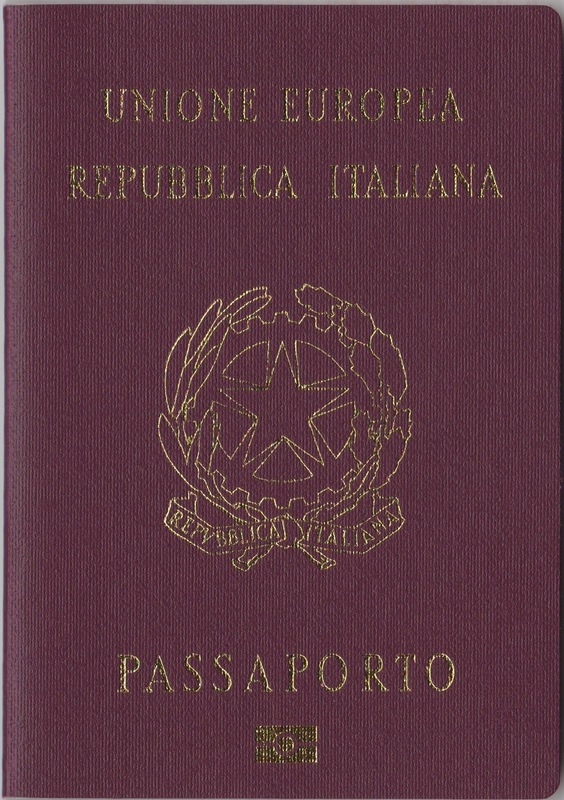 We are Italian citizens. Until a year ago, I did not know that my great-grandfather had two other brothers, Salvatore and Pietro. While I have been able to put together a list of their children from the 1920 and 1930 census records, I had no information about who their children married and who their children were. 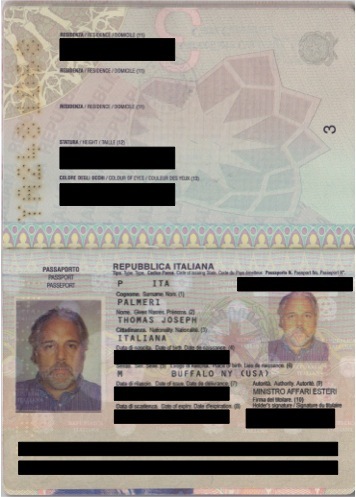 In part to flesh out the family tree, and in part to be able to share my findings with other Palmeris, I sent about 20 letters out to Palmeris living in and around Buffalo, I told them about the family tree I was putting together and I provided the information I have about the Palmeri family. In the past two days, I have gotten emails from one of Pietro's grandchildren and one of Salvatore's grandchildren. Both were willing to work with their cousins to fill out the Palmeri family tree.